Website visitors searching for more information about the U.S. internment programs of WW II will be interested in our numerous lists of internees of German ethnicity, especially it they are wondering whether their family members were interned and if so, where. Besides offering help requesting records from the National Archives and Records Administration (NARA), the German American Internee Coalition collected these lists of names, because other information in them can be useful in tracking down more files. Here are the lists we have, all in one place. 29 Feb 1944 Crystal City, Texas Camp Census (German American and Latin American internees plus one Italian family from Honduras) NARA, RG 59, State Department, Special War Problems Division, Entry A1 1357, Subject Files 1939-55, Box 191. Crystal City, Texas Internment Camp List of Deaths—courtesy of Werner Ulrich, a former internee, from information provided by Carmen Sanchez Diaz and Jose F. Cazares, residents of Crystal City, Texas. 29 Feb 1944 census NARA, RG 59, State Department, Special War Problems Division, Entry A1 1357, Subject Files 1939-55, Box 191. 29 Feb 1944 census, one page with one German name. NARA, RG 59, State Department, Special War Problems Division, Entry A1 1357, Subject Files 1939-55, Box 191. 1942-43 “detailed official” State Department lists of people of German ethnicity ordered interned—include name, date and location of birth, address when taken, next of kin and their address, occupation, and place of internment as of a specific date. Lists 15 and 33 are of Latin Americans. Compiled by the Provost Marshal General’s Office, War Department. All are found in NARA, RG 59, State Dept, Special War Problems Division, entry A1 1357, Subject Files 1939-55, Box 199. 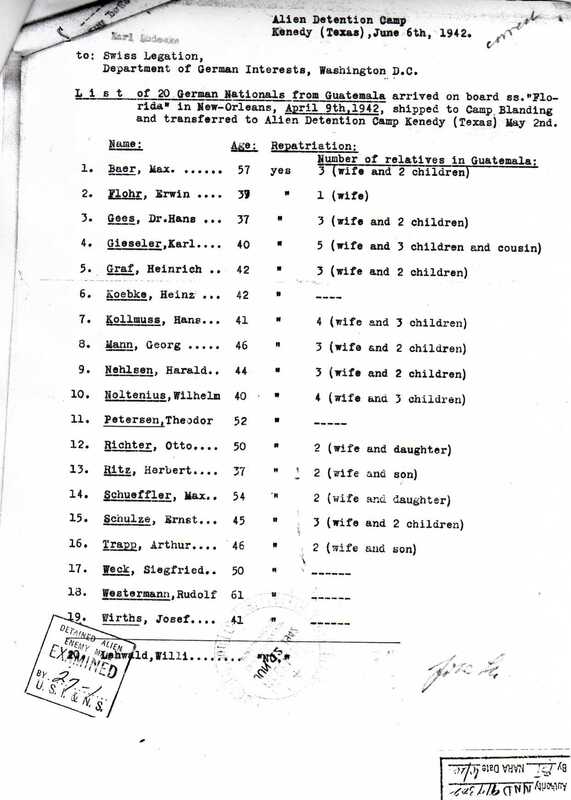 German Nationals Deported by the Other American Republics Who Were Deported Via the United States, 25 April 1946 25 Apr 1946, folder 711.5, Ecuador: Quito Embassy Confidential File, Box 35, RG 84, NA — Lists 3317 individuals, mostly in family groups, sent to Europe to be exchanged for individuals being held in Germany. Dates and ships used are listed on the last page. “German Nationals Repatriated from South and Central America” and “German Nationals Repatriated Direct from South and Central America” Records of the Special War Problems Division: Subject Files, 1939-1954; Entry A1 1357, Boxes 116 and 120, NA — Lists 1813 individuals deported directly to Europe from Latin America. Partial list of dates and ships used is on last page. Roster of Internees; Internees (German) Picked Up in Central America During 1943; Records Relating to German Civilian Internees During World War II, 1941-1946; entry A1 466J; Records of the Office of the Provost Marshal General, RG 389, NA. Copy of signatures of 117 Guatemalan deportees, 1942. From S.S. Drottningholm, a Swedish ship used in exchanges of Latin American civilians to Germany — Los alemanes en Guatemala, 1828-1944, by Regina Wagner, Guatemala, 1996. 6 June 1942 list of twenty Germans from Guatemala transferred from the SS Florida to Camp Blanding and on to the Alien Detention Camp Kenedy. 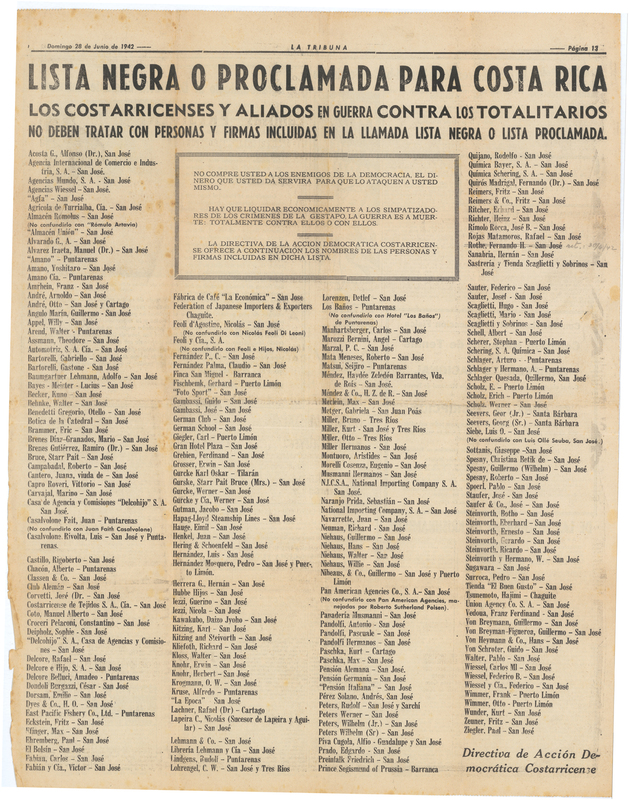 The Proclaimed List of Certain Blocked Nationals: July 17, 1941. Contains Presidential Proclamation 2497 authorizing a Proclaimed List and includes information for the press. Found on Fraser Federal Reserve Archive website. Partial List of ship manifests bringing prisoners to the U.S.